In the 60s, Chinese in Malaysia would give mi-fangs to friends and relatives when their daughter married. Since the 70s, cake shops emerged in large numbers. Mi-fang's role was gradually being replaced by cake. The purpose of giving mi-fangs or cakes was hoping that the married couple would have a happy marriage. 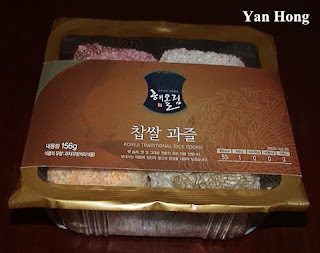 My son brought back a box of South Korean mi-fang (Rice cookie) when he returned from Seoul. I was surprised to know that mi-fang is one of South Korean traditional food. 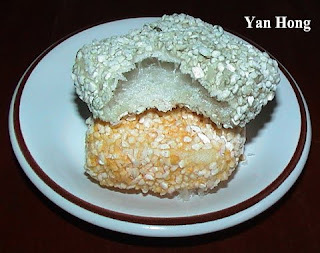 The ingredients of mi-fang are rice bubbles, butter and malt sugar. The process of making mi-fang is not difficult. First, boil butter and malt sugar in a pot and stir for about 5 minutes. Pour the mixture into a tray coated with butter. Add in appropriate amount of rice bubbles and stir until evenly. South Korean mi-fang is not too sweet and sticky. It's crispy and fragrant. 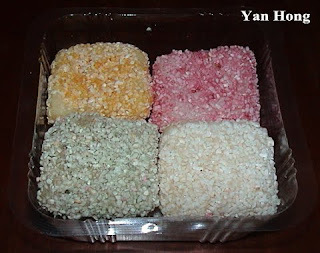 The reason why South Korean mi-fang is not sticky, perhaps honey was used instead of malt sugar. Spices had been added to make mi-fang fragrant.